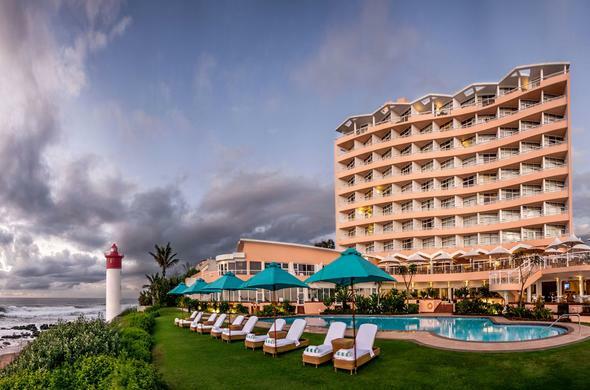 Positioned in one of South Africa's premier coastal locations, the Beverly Hills Hotel (Southern Sun Group) offers central Umhlanga Rocks accommodation in Durban designed to provide a comfortable stay for all guests. Durban is known to be one of the most vibrant and beautiful cities in South Africa. It comprises a number of fascinating suburbs, of which Umhlanga Rocks stands out. This area is characterised by breathtaking beaches and the warm waters of the Indian Ocean. Adding to the area's attractiveness is the fact that it is only a 20 minute drive from Durban, making it close to the many attractions in the city. Sophisticated travellers from around the world visit Umhlanga Rocks in search of the best of sun, sea and glamour. The Beverly Hills Hotel offers Umhlanga Rocks accommodation consists of 89 guest rooms and suites. All of the rooms offer spectacular views of the ocean. Theis Umhlanga hotel provides a place where travellers can feel at home and unwind. It has a fitness centre on the property for those who prefer to be a little more active while they travel. There is also an outdoor swimming pool. For a truly relaxing experience, the hotel provides personal loungers set up on the beach in front of the hotel for guests. This hotel in Umhlanga Rocks has a signature restaurant, The Sugar Club, offering food that is rated amongst the best in the country. It has a contemporary ambience with dramatic views of the Indian Ocean. There is also a bar on site called the 'elements café bar' which has a more relaxed feel. It offers a gourmet café menu.